[Sat Jan 05 13:50:47 2019] Your faction standing with The Freeport Militia has been adjusted by -5. [Sat Jan 05 13:50:47 2019] Your faction standing with Coalition of Tradefolk Underground has been adjusted by -1. [Sat Jan 05 13:50:47 2019] Your faction standing with Knights of Truth has been adjusted by 1. [Sat Jan 05 13:50:47 2019] Your faction standing with Priests of Marr has been adjusted by 1. 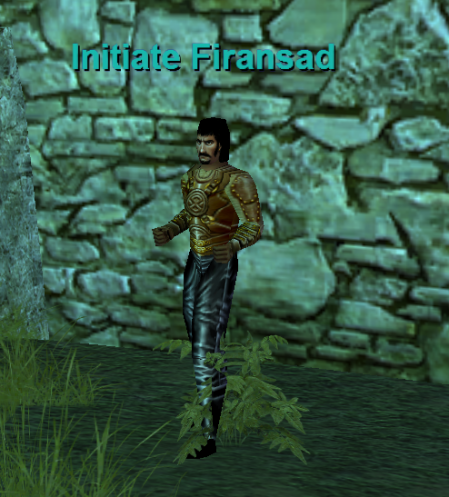 [Sat Jan 05 13:50:47 2019] You have slain Initiate Firansad! His guy can on longer be found in the commonlands, must have not made the change from EC and WC to just the one zone. The 1st time I pulled him to FP zone & that was bad--Firensad took straight into the loving fists of Slate. The 2nd time I pulled to Nek zone & that worked great. This guy does hit hard & fast--he's a monk go figure--& by the time I could solo him, the result of the quest was pointless. However, if you're looking to get that final piece of quest armour weaponry, it's a nice item to see in your bank. Looks like an Ulak in your slots but on your avatar looks like a glowing red nimbus around your fist.